"Caleb is playing the Matchless 2x12s DC. It’s kind of cool, it's its own thing. It's got tone selector switches, it sound can't really dial out the middle, bass, and stuff like that. It just gives you what it gives you. It's pretty good though, pretty loud if you want it to be," says Caleb Followill's guitar tech. First submission notes: its a costume dc 30. Complementary submission notes: Since many years back, the Followills have been using Matchless amps for their performances. However, opposite to Caleb, who recently plays his guitar with a pair of AC15C1 amps, Matthew Followill have been playing through a Matchless DC-30. There are more pictures and videos showing up his amp (or amps, when he carries out a backup). In this Instagram post by Matchless Amplifiers (@matchlessamps) from 31st Oct 2015, there is the caption, "New #MatchlessAmps #DC30 for Dave Keuning of the Killers in #KCRoyals colors." Sheryl Crow is using Matchless DC-30 guitar amps. On the [Gear page](http://www.billyduffy.com/gear/matchless-dc-30-amplifier/) of Billy Duffy's website, he says, "I’m a big fan of Matchless. Their amps were introduced to me by Bob Rock when I was recording ‘Sonic Temple’. I used them in the studio but didn’t use them live until after the ‘Ceremony’ tour. At that point I finally went and bought one in Los Angles and started using it in sessions and stuff. They’re a great sounding combo amplifier, better than a Vox AC 30 and better than a Fender Twin." According to Fortus' website, Fortus also uses the Matchless DC-30 amplifier. Jeff Lynne played MATCHLESS DC30s during thr Royal Variety Performance in 2016. At 2:13 minute mark on performance of "Brill Bruisers" the black Matchless DC30 combo can be seen behind Newman. 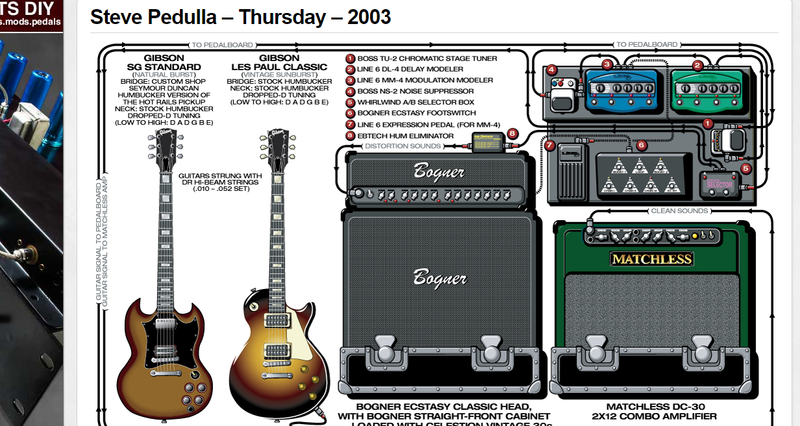 Steve Pedulla, of [Thursday](http://equipboard.com/band/thursday), and his tech discuss his Matchless DC-30 2x12 in this [interview](http://www.guitargeek.com/steve-pedulla-thursday-guitar-rig-and-gear-setup-2003/). In this photo, along with the Fender Jazzmaster, the Matchless DC-30 combo amp can be seen. Same as the VOX. Nige gets part of his effects sounds from here. 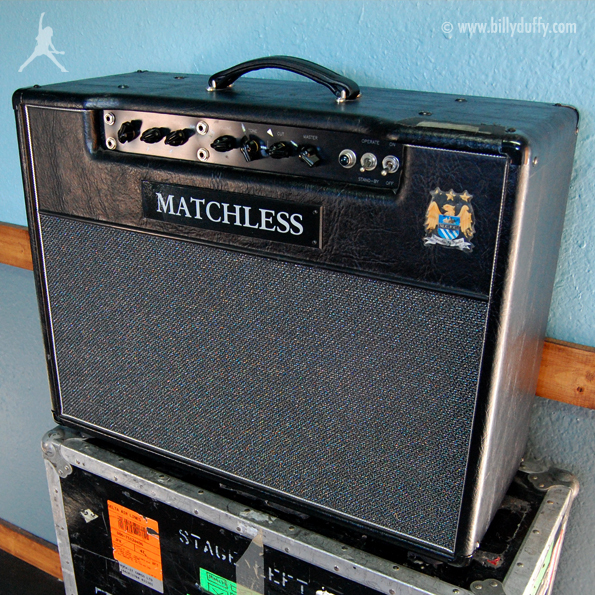 "I have a Matchless 2×12 combo, and I use it a lot. I’ve also got a ’65 Fender Deluxe Reverb, I guess it’s my all-time favorite little amp. That’s mostly what I use in the studio. Another one I use for the studio is a Hullett Deluxe, which is all-tube with one 12? Eminence speaker; the extension cab has a 12? Weber VST. It’s kind of like a Deluxe Reverb…except it doesn’t have reverb. [Nashville session guitarist] Bill Hullett’s son, Clay, makes the amp." The preamp sections are based on a layout of two 12AX7's in Channel 1 and one EF86 in Channel 2. The two 12AX7's in Channel 1 create a parallel-triode circuit with interactive bass and treble. The one EF86 in Channel 2 consists of a high-gain pentode coupled to a six-position tone switch. Outright benefits include quick dial-in of new tones and an easy return to the settings you prefer. Also "high treble" cut control, master volume, with a bypass feature that offers flexible control of the power amp section. The power amp is fed by a 12AX7 phase inverter, which drives four EL84 power tubes. The rectifier circuit gives you the flexibility of using one 5AR4 for a quick attack or you can use two 5V4's for a smooth, round response. Other professional features include an effects loop, half power-mode switch (a conservative 30 watts switching to 15 watts), output impedance selector (4, 8, 16 ohms) and a speaker phase-reverse switch. Sound on the 212 Combo is delivered through two dissimilar Celestion speakers: a G12H30 and a Greenback 25, each specially modified through a proprietary MATCHLESS formula. All of this is encased in an extremely sturdy hand-made 11-ply, ¾” Baltic birch cabinet, wrapped in richly textured black vinyl. The finishing touch is our signature backlit nameplate and control panel, which lets you (and the audience) know when the power is on. Bought it on reverb.com for about £600 in mint condition, and it was my main amp for 3 years. I traded it carelessly for a Boss GEB7 and would do anything to have it back. It has a beautiful clean sound as well as a decent overdrive sound and can take pedals to the point of insanity. I loved it to tears. Mistake: it was a GE7 not a GEB7.